Please select from the right hand navigation. (No. 2 & Btr.) Used in most construction. High strength, stiffness, good appearance. Preferred for trusses, rafters and joists. No. 3 -------------- Used when high strength and appearance are not important. (Std. & Btr.) Common mix used in general framing. Have less strength and shorter spans than No. 2 & Btr. Structural light framing. (design values not assigned) --------------- Used most economically where high strength is not important. 1. For ease in grade sorting, the higher grades are combined and sold as a grade mix. Pieces in the grade mix are still individually grades stamped. 2. Except for the economy grades, all grades are stress graded. For additional information on wood species use in construction, visit the Canadian Wood Council web site www.cwc.ca, the Southern Pine Marketing Council www.southerpine.com or the Western Wood Products Association www.wwpa.org. Lumber is stamped with a grademark to show its grade. The American Lumber Standard Board of Review set the standards and qualifies grading agencies. Each grade stamp shows the name or symbol of the agency, the number of the mill, the species group, the grade and the classification S-DRY of S-GRN. S-DRY indicates that the lumber has a moisture content of 19% or less after being kiln dried. S-GRN has a moisture content greater than 19%. The following is a facsimile of a grade Stamp. The basic unit of measure of lumber cut from a log is the board foot. A board foot contains 144 cubic inches of volume. It is generally easiest to compare any piece of lumber to a board foot of lumber measuring one (1) inch thick, twelve (12) inches wide and one (1) foot long. Lumber under one (1) inch thick is generally considered the same as one (1) inch thick for estimating purposes. To calculate the BOARD FEET in a given piece or amount of lumber, use the formula: T" x W" x L' ÷ 12 = Bd. Ft.
To convert board feet to linear feet: 12 ÷ T" x W" x Bd. ft. = Linear ft. These span charts represent the most commonly available grades of Canadian Dimensional Lumber. Spans are for use in the USA and for dry service conditions. For other grades and loading conditions and spacing refer to the Canadian Dimension Lumber Data Book published by the Canadian Wood Council. www.cwa.ca Span charts courtesy of the Canadian Wood Council. No. 2 No. 3 Sel. These span charts represent the most commonly available grades of western dimensional lumber. Spans are for use in the USA and for dry service conditions. 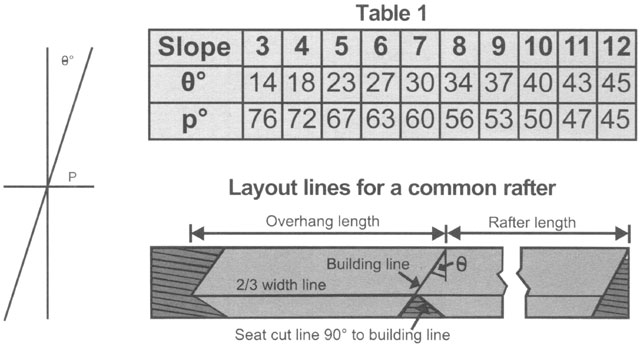 For other grades and loading conditions and spacing refer to the Western Lumber Span Tables published by the Western Wood Products Associations. www.wwpa.org. Span charts courtesy of the Canadian Wood Council. treated wood is approved for exterior use above ground. treated wood is approved for exterior use and can be touching or in the ground or fresh water. is approved for use in permanent wood foundations. Wood Treated with ACZA can be special ordered and is rated for use in salt water applications by the AWPA. According to tests designed and approved by the American Wood-Preservers' Association, the new treated lumber is more corrosive to fasteners than the old CCA (Chromated Copper Arsenate) treated wood. The Manufacturers of ACQ® (Alkaline Copper Quat), CA (Copper Azole Type A and B) and SBX (Sodium Borate) and the treated wood industry are all recommending hot-dipped galvanized and stainless steel nails and screws with their treated wood products. Fasteners must meet the ASTM A-153 specification for hot-dipped galvanizing. When selecting deck fasteners, framing nails, decking nails or screws, take note of the holding capacity and the resistance to corrosion. When quoting an outdoor construction project for a client, encourage them not to skimp on the fasteners. Using the wrong fasteners can compromise the appearance, longevity, and safety of their project. Many fasteners traditionally used with treated lumber are no longer recommended for this application. Dacrotized, electroplated, brass and aluminum fasteners should not be used in treated lumber when the visible appearance of rust or the likelihood of corrosion is unacceptable. Includes but is not limited to triple coated screws first galvanized then covered with a ceramic or Teflon (or similar material) layer with top sealer coat. The requirements for use with treated wood should conform to the following ASTM Standards: ASTM 153 (for Hot-Dip fastener products) and ASTM-A 653 (Coating Designation G-185 for Hot-Dip connector and sheet products). NOTE: Hot Galvanized does not equal Hot Dip Galvanized. There may be additional products (other than stainless steel or hot-dip galvanized) that are suitable for use with ACQ treated wood. Please consult with the fastener or hardware manufacturer for use recommendations. Double sanded face, extra smooth Cabinets, shelving, underlayment, porch ceilings, soffit. 1/4",3/8", 1/2" 5/8", 3/4"
Sanded panel with a solid core. Cabinets, shelving, underlayment. 1/4",3/8", 1/2" 5/8", 3/4"
Touch-sanded. High impact resistance. Subfloor for areas to be carpeted. 3/8", 1/2", 5/8", 19/32", 23/32", 3/4"
Oil treated. Concrete forms. 5/8", 3/4"
Span rated for general construction. Subflooring, wall and roof sheathing. 3/8", 7/16", 15/32", 1/2", 19/32", 5/8", 23/32"
Unsanded panel used where strength is important. Diaphragms, gussets plates, skin panels. 3/8", 7/16", 15/32", 1/2", 19/32", 5/8", 23/32", 3/4"
High Impact resistance. Smooth surface on one side. Subfloors, square edge or tongue & groove. 19/32",5/8", 23/32", 3/4", 1", 1-1/8"
Subfloor-underlay 32" & 48" spans. SE or T&G Subfloors and heavy timber roof construction. 7/8", 1-1/8"
Use hangers with sloped seals whenever the slope exceeds the following: 1/2:12 for seat bearing lengths of 2 1/2 inches or less; 3/8:12 for bearing lengths between 2 1/2 inches and 3 1/2 inches; and 1/4:12 for bearing length in excess of 3 1/2 inches. Fasten together multiple piles of wood I-joists, in accordance with the manufacturer's installation guidelines, such that the joists act as a single unit. It may be necessary to install straps, blocking or sheathing to restrain torsional rotation of a supporting wood I-Joist when using top mount I-joist hangers. Install only the specific nails. The flanges of wood I-Joists may split if larger diameter nails or longer nails are installed. Do not install nails larger than 16 penny common (0.162 inch diameter) into the web stiffeners in the wood I-joist. Pattern the nails used to install backer blocks or web stiffeners in wood I-Joists to avoid splitting the block. The nail pattern should be sufficiently spaced and avoid the same grain line, particularly with solid sawn backer blocks. Backer blocks must be installed on the wood I-joists acting as the header, or supporting member. Install in accordance with the I-joist manufacturer's installation guidelines with the backer blocks seated against the bottom flange of the supporting header when using the face mount hangers, and against the top flange if using the top mount hangers. The nails installed to hangers mounted to an I-joist header must penetrate through the web and into the backer block on the opposite side. Framing Stock N80, N70, N100s BS = Bostitch Stick 2" - 3 1/2"
Framing Coil N80C CW = Coil Wire 2" - 3 1/4"
Coil N55C, N65CP, N63CP BC = Bostitch Coil 1 1/4" - 2 1/4"
Roofing Nailer N12B-1, RN45 CR = Coil Roof 1" - 1 3/4"
Roofing Stapler T40S2-CT, T35-32, T35-8 SBW = Staple Bostitch Wide 1" - 1 1/2"
Floor Stapler MII SBF = Staple Bostitch Flooring 2"
Finish Nailer T36, N60FN BFT/BFN = Bostitch Finish Nail + T-Nail 1 1/2" - 2 1/2"
Brad Nailer BT35, BT50 FB = Finish Brad 5/8" - 2"
Finish Stapler SX Series SBN = Staple Bostitch Narrow 3/8" - 1 3/16"
Framing Nailer SN2, SN4, SN70, SN325 PCH = Paper Clip Head 2" - 3 1/2"
Framing Coil SCN60, SCN65 CW = Coil Wire 2" - 3 1/2"
Framing Nailer SN60 PS = Plastick Stick 2" - 3 1/2"
Roof Nailer SCN200R, SCN40R CR = Coil Roof 1" - 1 3/4"
Sheathing Stapler MI, MII SSI = Senco Staple Intermediate 1" - 2"
Roofing Stapler PW, MW SSW = Senco Staple Wide 1" - 1 1/2"
Finish Nailer SFN1, SFN40 SFN = Senco finish Nail 1 1/2" - 2 1/2"
Brad Nailer SLP20 FB = Finish Brad 5/8" - 1 5/8"
Finish Stapler SLS20 SSN = Staple Senco Narrow 3/8" - 1 1/2"
Framing Nailer 5300-5350-SK312, F-350s, IM325 PCH = Paper Clip Head 2" - 3 1/2"
Finish Nailer 3250 F16, MU212-F16, Trimpulse PFN = Paslode Finish Nail 1" - 2 1/2"
Finish Stapler 3150-N18, 2125-N18 SPN = Staple Paslode Narrow 1/2" - 1 1/2"
Framing Stick NR-83A, NR90AC PS = Plastic Stick 2" - 3 1/2"
Framing Coil NV83A, NV65AC CW = Coil Wire 2" - 3 1/4"
Framing Stick NR83AA PCH = Paper Clip Head 2" - 3 1/2"
Coil Roofer NV-45 AB CR = Coil Roof 1" - 1 3/4"
Coil Siding NV50AA, VH650 HCP/HCPX = Hitachi Coil Plastic .099/.083 1 1/4" - 2 1/2"
Sheathing Stapler 5008AA, AB SSI = Staple Intermediate 1" 2"
Finish Nailer NT65A, NT65A2 PFN = Paslode finish Nail 1 1/4" - 2 1/2"
Finish Nailer NT65AA SFN = Senco Finish Nail 1 1/2" - 2 1/2"
Brad Nailer NT45A, NT50AD, NT32AE, NT50AE FB = Finish Brad 5/8" - 2"
Framing Stick FR350 PS = Plastic Stick 2" - 3 1/2"
Framing Stick FC350 PCH = Paper Clip Head 2" - 3 1/2"
Finish Nailer FN200, FN250, CFN250 PFN = Paslode Finish Nail 3/4" - 2 1/2"
Finish Nailer DA250, CDA250 SFN = Senco Finish Nail 1 1/2" - 2 1/2"
Brad Nailer BN125, BN200 FB = Finish Brad 5/8" - 2"
Framing Stock AB8300 PS = Plastic Stick 2" - 3 1/2"
Finish Nailer F631 BFN = Bostitch finish Nail 1 1/2" - 2 1/2"
80 3 or 4 12"
Three-Tab 215# to 300# 65 to 80 3 or 4 12" to 13 1/4" 36" to 40" 5" to 5 5/8"
Select slope factor for given slop in table. Multiply horizontal span by "Slope Factor". 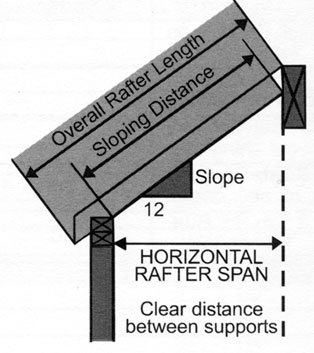 If slope is 4 in 12 and rafter span is 12'-6", the sloping distance = 12.5 x 1.054 = 13.175' or 13'2". 3. Draw the building line. 4. Draw 2/3 width line from the top edge of rafter. 5. Use square to draw seat cut in from bottom edge of rafter to intersect building line. Note: the birdsmouth notch should be limited to 1/3 the rafter width to maintain 2/3 of the rafter section. 1. Determine the number of square feet of rectangular wall areas. Measure the length of the walls. Measure the height of the walls to the bottom of the gables. Multiply the L x W to determine the number of square feet. 2. 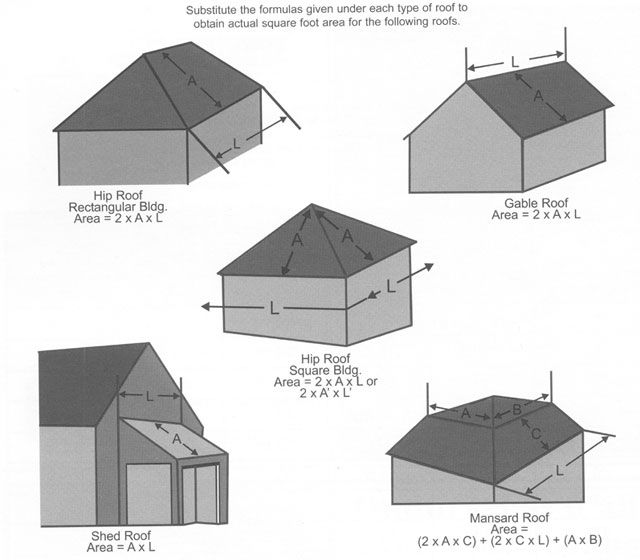 Determine the number of square feet of gabled areas. Measure from the bottom of the gable to the top of the gable. Determine from chart A the total number of square feet for each gable area. 3. Add all areas together to determine total square footage required. 4. Determine the total area of all windows and doors and subtract the square footage. 5. Add 10% factor for waste. From chart below determine how many pieces of siding are required. Fiberglass combines high thermal efficiency and light weight. It is resilient, versatile, economical material excellent for use as a cavity insulation between wall, floor and ceiling framing members. Energy-efficient foamboard sheathing panels are designed as an alternative to conventional plywood and softboard sheathing systems. The higher the R-Value, the greater the insulating power. Good Excellent Good Good, designed for Immersion. Excellent Fair Excellent Good to porous surfaces, poor to nonpourous ones. Proper ventilation is required to prevent the buildup of damaging moisture that is generated from normal household activities such as laundry, showers, dishwashing and cooking. Ventilation is also necessary to reduce attic temperatures to prevent premature roof aging and to improve energy efficiency. As a general rule, one square foot of net free vent area (NFVA) per 300 square feet is recommended. For a balanced system, ventilation should be equal at the undereave and ridge. If proper distribution of undereave and ridge vents cannot be achieved, one square foot of NFVA should be provided for each 150 sq. ft. of area to be vented. Requirements may vary by locality. Check your local building codes. Adheres tape to joints. First coat coverage for nails and corner bead. 25 lb. bags 15-20 lbs. Per 1000 sq. ft. Same us as setting type compound. Applies and sands easier, shrinks less. 22 lb. bags 15-20 lbs Per 1000 sq. ft.
61.7 lb pails, 48 lb. cartons 60 lbs. Per 700 sq. ft.
48 lb. cartons 40 lbs per 700 sq. ft.
Cartons and pails 4.5 gallons Per 700 sq. ft.
For spray application only as a decorative finish for wallboard or concrete ceilings. Not recommended for high-moisture areas such as bathrooms. 40 lb bags Varies from 300 to 400 sq. ft. per bag. For spray application only. Designed for volume applications on wallboard or concrete ceilings. Not recommended for High-moisture areas. 32 lb. bags 250 sq/ ft. per bag. Designed for roll-on application to interior ceilings. Provides a hard, white, textured surface. 2 gallon pails 60 to 120 sq. ft. per 2 gallon pail. Number of 60 Lb. and 80 Lb. bags of redi-mix concrete required to pour a concrete slab. The total of one riser and one tread should not be less than 16" or more than 18". Unit rise should be 7" to 8". Unit run should be 9" to 11". In inches, determine the total rise from the finished floor of the lower level to the top of the finished floor of the top of the finished floor of the upper level. Divide the total rise of the stair by 7". Round back to the nearest whole number of riser. For example, if you get 13 and 3/4 risers, you would round back to 13 risers. Determine the height of the riser by dividing the total rise by the number of risers required. In inches, determine the total run from a point at the head of the stair to the outside edge of the last riser. The distance from the top of the baluster rail to the top of the tread, at the middle, should be no less than 32" and no more than 36". Determine the length of the tread by dividing the total run by the number of treads. 12 8" 9" 8' 3" 6' 8" 8' 1"
13 7 3/8" + 9 1/2" 9' 6" 6' 8" 9' 2 1/2"
13 7 3/8" 10" 10' 0" 6' 8" 9' 8 1/2"
13 7 7/8" - 9" 9' 0" 6' 8" 8' 3"
14 7 5/16" - 9 1/2" 10' 3 1/2" 6' 8" 9' 4"
14 7 5/16" - 10" 10' 10" 6' 8" 9' 10"
14 7 11/16" + 9" 9' 9" 6' 8" 8' 5"
15 7 5/16" + 9 1/2" 11' 1" 6' 8" 9' 6 1/2"
15 7 5/16" + 10" 10' 6" 6' 8" 9' 11 1/2"
NOFMA Hardware Flooring Must be installed over a proper subfloor. T&G must be blind nailed on the tongue edge along the length of the strip/plank and near the ends (1"-3") with face nailing required on starting runs (1-2) and finishing runs (2-4), Sq. edge must be face nailed. Inadequate nailing contributes to cracks and noisy floors by allowing movement of the floor. Must install over proper sub-floor 2" barbed flooring cleat, 7d or 8d flooring nail, 2" 15-gauge staples with 1/2" crowns 10-12" part, 8-10" preferred. 1/2"x 1 1/2" & 2"
Must install over proper sub-floor 1 1/2" barbed flooring cleat, 5d screw, cut steel or wire casing nail. 10" apart. 3/8" x 1 1/2" & 2"
Must install over proper sub-floor 1 1/4" barbed flooring cleat, 4d bright wire casing nail. 8" apart. 5/16" x 1 1/2" & 2"
Must install over proper sub-floor. 1" 15-gauge fully barbed flooring brad. 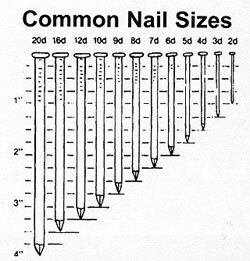 2 nails every 7"
Widths 4" + must install over proper sub-floor 2" barbed flooring cleat, 7d or 8d flooring nail or 2" 15-gauge staples with 1/2" crowns. Blind nail 8" apart. May require face nailing for additional fastening. Follow manufacturer's instructions. Warning: All wire must be protected according to amp rating, installation of electrical wire can be hazardous. The above applications are general applications. Consult a professional engineer for special conditions. Always consult the National Electrical code and your local building/electrical Inspector.